TENAX snow fencing is an effective alternative fence solution for a variety of commercial and residential applications. For one, this 4' snow barrier fence in orange has received high marks as a safety fence being used on road sides to reduce accidents caused by snow. Snow barrier fences offer numerous benefits to farmers, too. This type of agriculture fence improves access to farm areas and helps reduce soil erosion. It even stops wildlife from eating crops on rural land and serves as a security system. 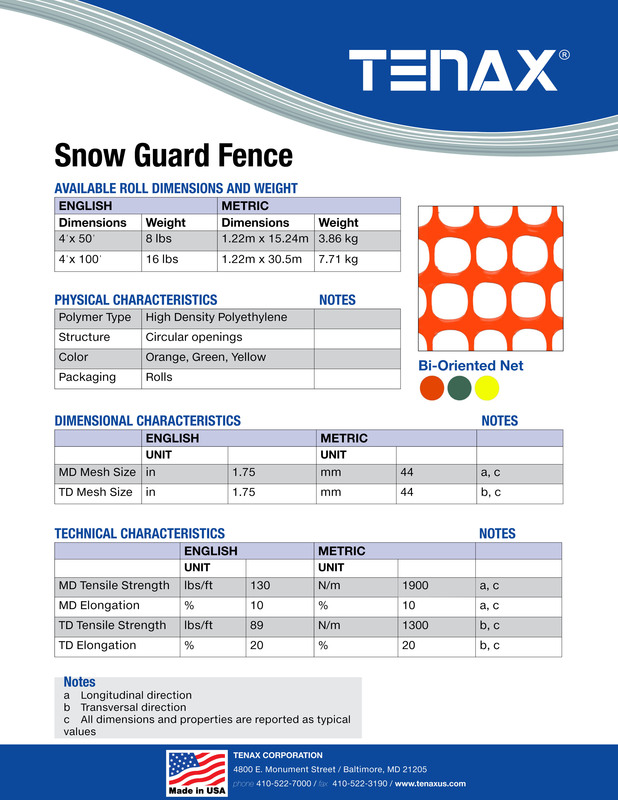 This TENAX snow fence is made from a strong polyethylene material with 1.75" x 1.75" mesh circular openings. Weighing in at 16 lbs per roll and with a tensile strength of 89 lbs/ft, this 4' x 100' TENAX snow fence can also be used to block snow drift in parking lots, at airports, and industrial buildings.